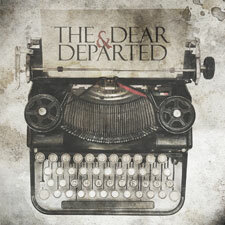 It's hard to determine whether the Dear & Departed's newest endeavor will appeal more to fans of the 1980s English rock scene, or really just the modern bands influenced by said movement. Any way you slice it, though, the band's newest release, Chapters, is a competent–albeit not always compelling–five-song EP that will likely gain some interest from both sides of the coin. No one will actually mistake Chapters as being birthed in the '80s, though. New Found Glory guitarist Chad Gilbert instills the EP with some pristine, gleefully glossy coatings that actually make for the best-sounding entry yet in the producer's budding career. But as much as any listener will recognize Chapters as being a product of the 21st century, they're also likely to find some comfort in its bustling, arena-goth vibe. "Did You Hear A Knock?" sounds like those moments when Nightmare Of You channel Echo & The Bunnymen's breezy, nimble guitar tones. "Tambourine Love" adds sparse moodiness to its verses in an effort to contrast its sunnier chorus; it's like the rest of the Cure got Robert Smith to forget about the razors for a while. Love when Davey Havok broods like his favorite goth stars of yesteryear? Try closer "There For The Taking," where frontman–not to mentionL.A. Ink star–Dan Smith showcases some of his better vocal range abilities atop the EP's finest bassline. While Chapters doesn't always sound as enthusiastic, sincere or unbridled as the Dear & Departed seemingly have the potential to be, its carefully slick melodies and fluid approach otherwise make it a pretty rewarding teaser of sorts. Next articleNever Shout Never – What Is Love?